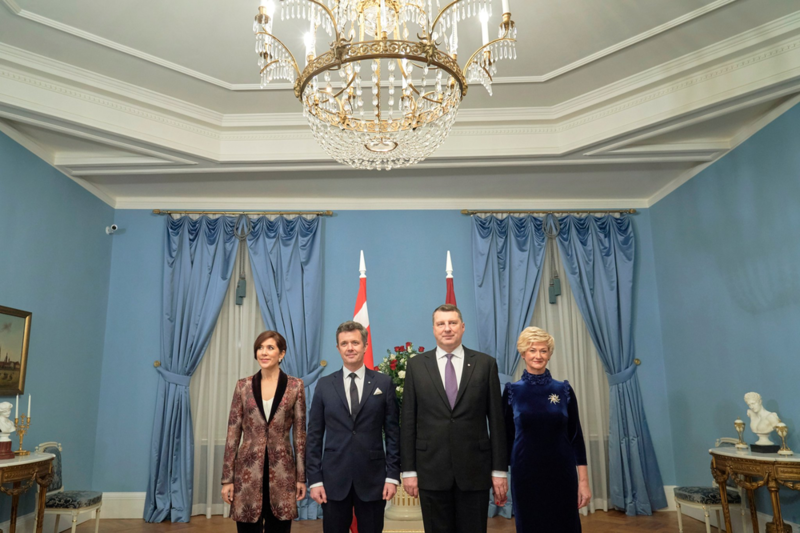 In December, the Crown Prince couple travels to Latvia to participate in celebrating the country's 100th independence. Besides the official celebration, the visit will focus on art, design and history. 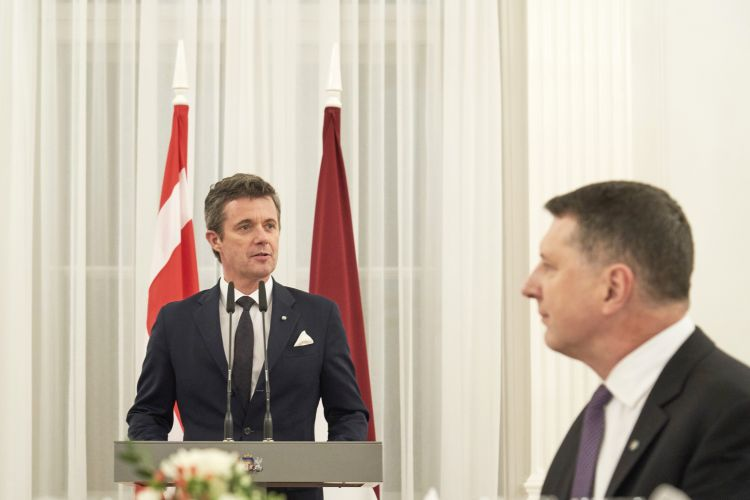 Crown Prince Frederik and Crown Princess Mary will visit Latvia on Thursday and Friday to participate in the celebration of Latvia's 100th anniversary as an independent country. Even though the Jacqueline Kennedy-craze was a little before my time, Mary looks like a modernized version of Mrs. Kennedy. Hende kan vi godt være bekendt. - Difficult to translate directly, but rest assured it's a big, albeit understated, compliment. What a great first day so far! Busy schedule but Frederik and Mary make a great team. They look very distinguished and elegant. 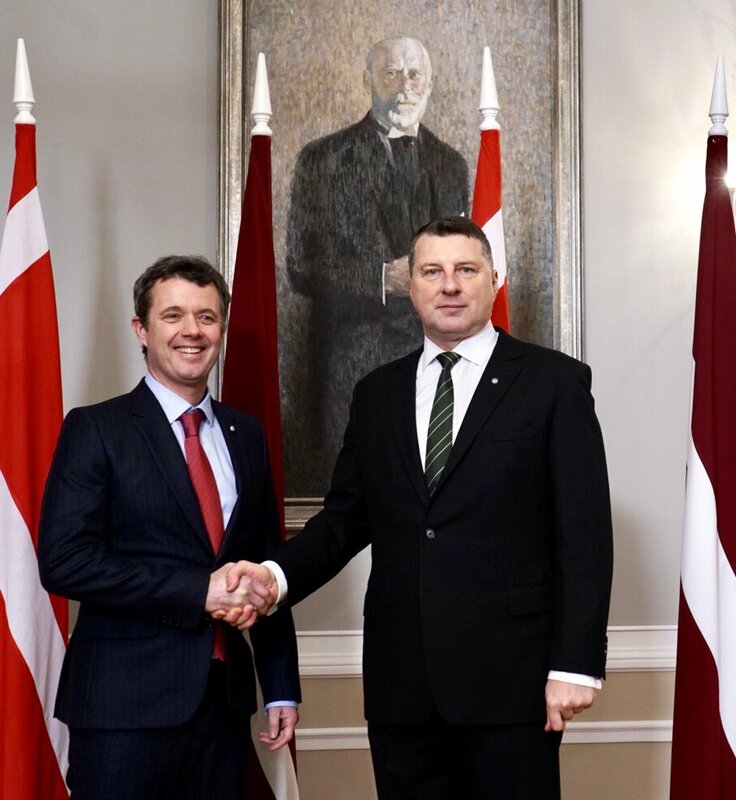 "It is a pleasure to meet again with the student friend the Danish Crown Prince Frederik"
Interestingly M&F went over to some over onlookers who were local M&F fans to have a chat - in Danish. Danish and Latvian is by no definition similar, but quite a few Latvians study or work in DK and as such they inevitable pick up some Danish. 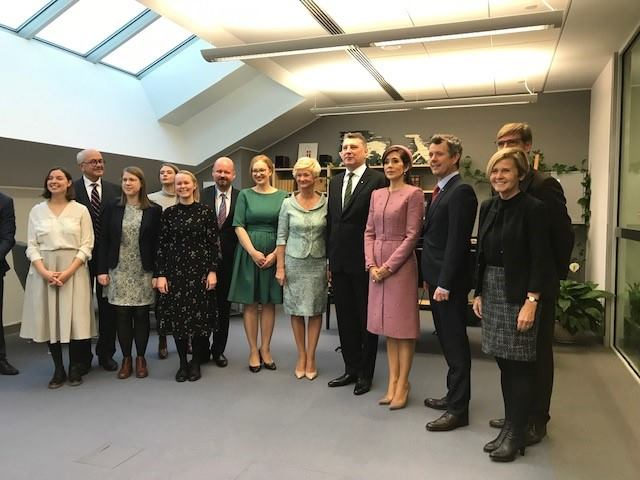 As Lativians along with other Balts these years often have the worst and worst paid jobs in DK, I can only hope they don't have a too poor impression of DK. This is a wonderful picture! It's certainly beginning to look a lot like Christmas In Latvia. A nice little BB video of Mary in the snow. As you can tell a little snow is something the Latvians hardly notice. (There is more frequent snow in Latvia than in DK.) But when you walk on high heels, I guess it becomes a little challenging! I'm actually more concerned about Mary's LiW (I think) in the background. She ain't happy! 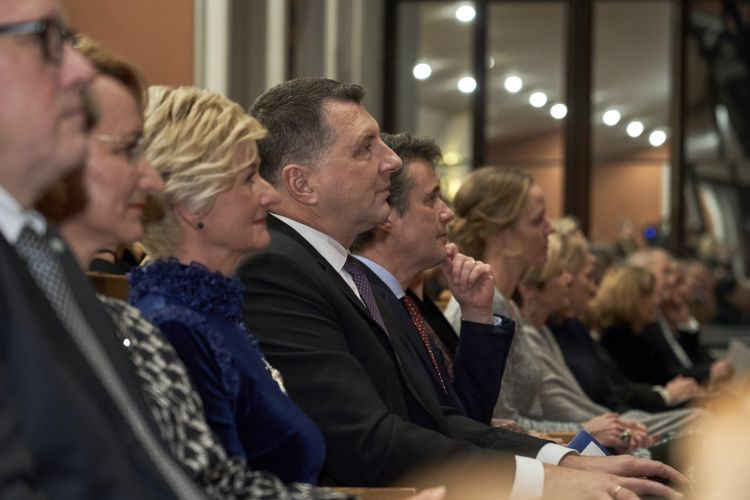 A 30 pic gallery in this Latvian article where Mary is apparently praised for her style. My Latvian is a bit... rusty. 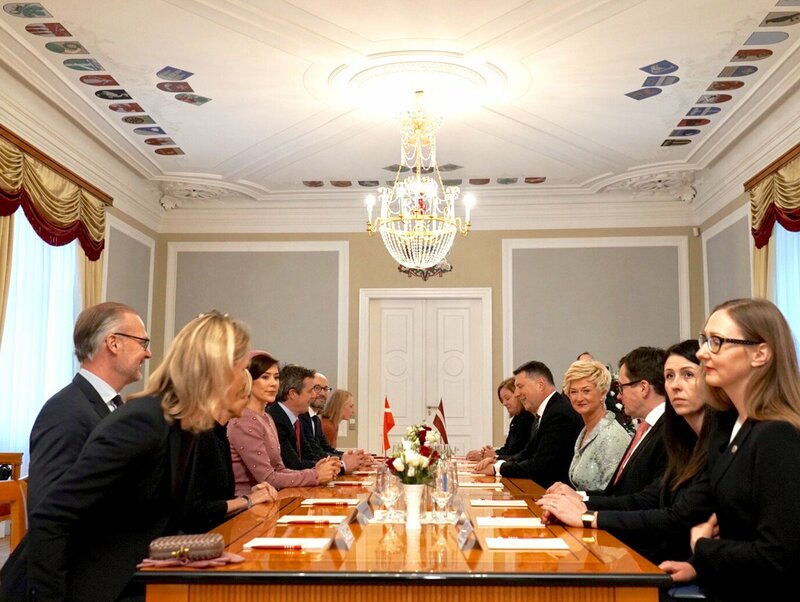 Notice how Frederik in several of the pictures is checking that a prankster hasn't sewn his pockets shut. Don't tell Polyesco about this photo! Summary of article in Billed Bladet #50, 2018. 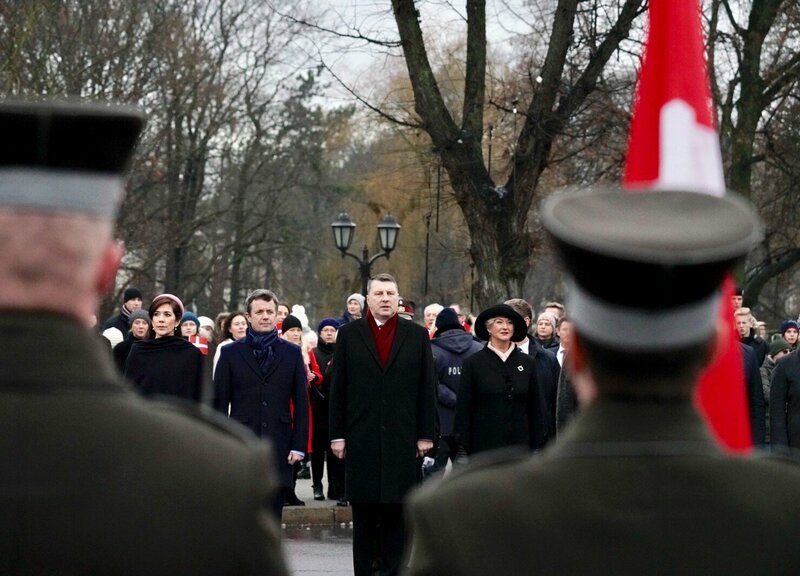 The purpose of M&F's visit to Latvia was to celebrate the 100th anniversary of the country's independence. The three Baltic countries gained independence in the wake after the Russian Revolution. 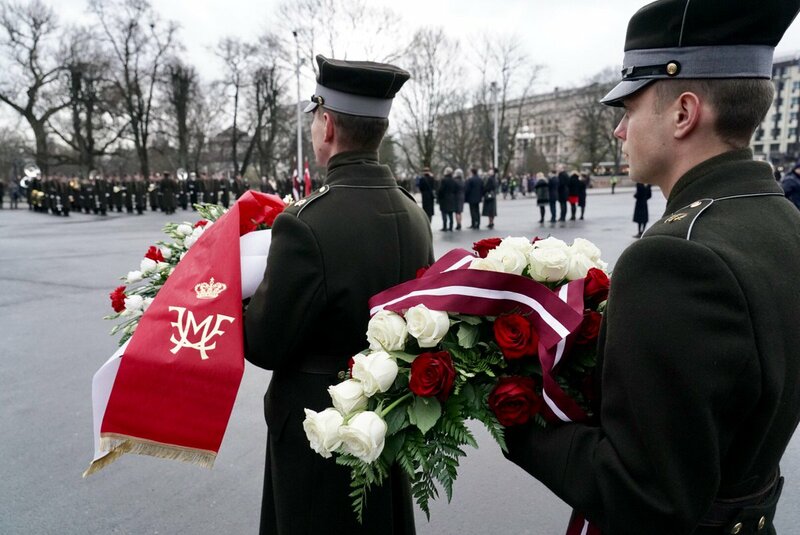 In fact mercenaries from especially Latvia played a prominent role right after the Russian Revolution, when the Communists still had a tenuous grip of the power and there were several "what if" incidents involving Balts which might have prevented the Communists from taking over. But that's another and very fascinating story. 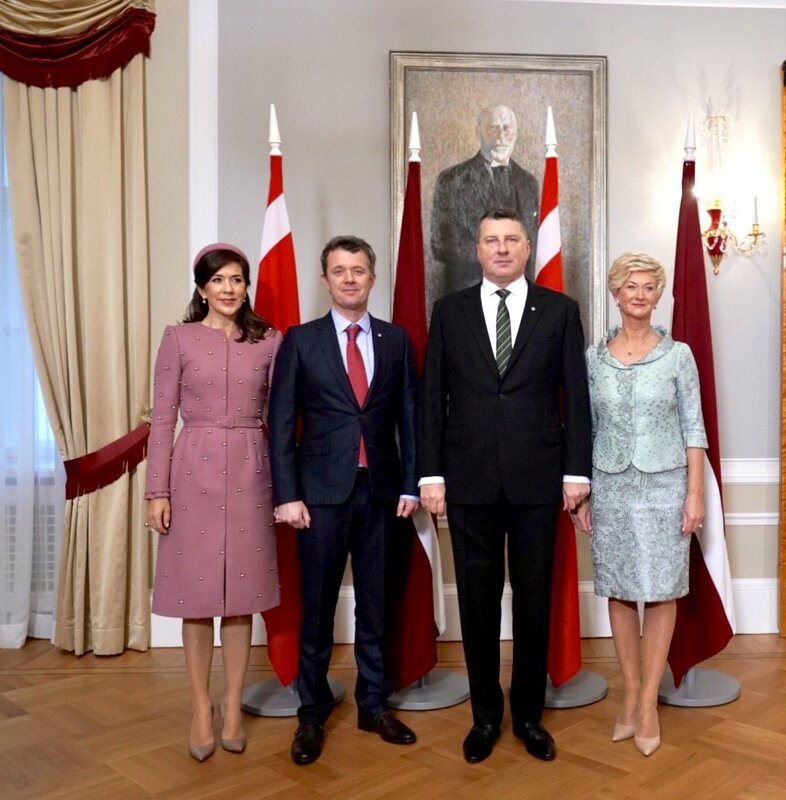 Anyway, M&F were received at the castle in Riga by the President of Lativia, Raimonds Vejonis and his wife, Iveta. And here both national anthems were sung, before the party went inside for photos, signing of the guest book and small talk. 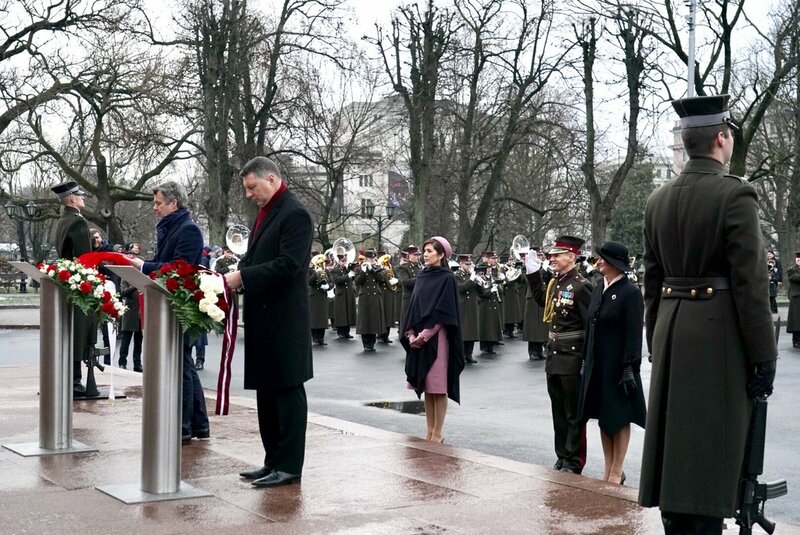 The formalities over with M&F went to the Freedom Monument to honor the fallen from the war of indenpendece in 1918-20. And here they met some of the locals in the shape of the Danish teacher, Daiga and her students, all speaking impressive Danish. 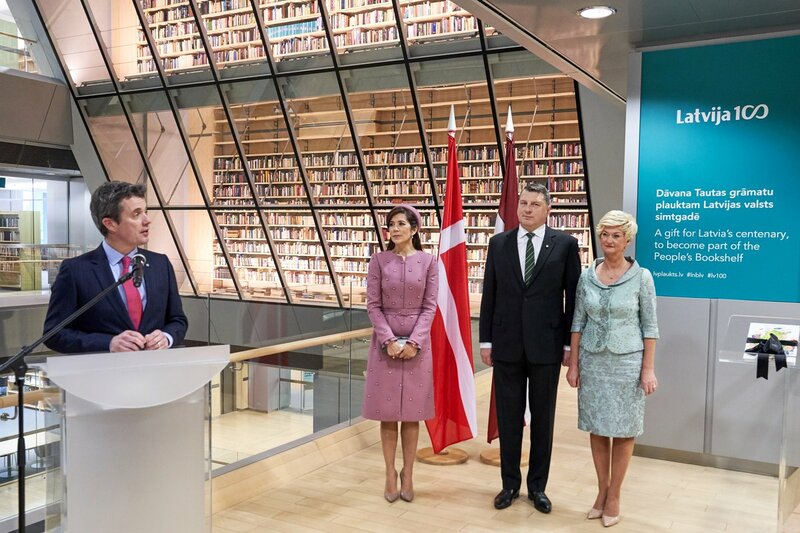 Next item on the agenda was a visit to the National Library, where a book with a foreword by Frederik was presented to Lativia. Mary was wearing a pink, Jaquiline Kenendy suit by Claes Iversen. Her pillbox hat is by Susanne Juul. Her earrings by Dulong Fine Jewellery. Her clutch was by Bottega Veneta and shoes from Gianvito Rossi. There is tendency to snow at this time of year in the Baltics, and often suddenly. That was also the case while M&F were there. So when Mary left a rehabilitation and counseling center for children a fresh white layer covered the ground. No big deal, except when your wearing high-heeled Gianvito Rossi shoes and you can't what's under the snow! Mary was however undaunted and carefully made it to the car. Her very appropriate frost-blue coat was by Joseph, combined with a silk blouse from Stine Goya. Free from bullying is being implemented in Lativia, very much inspired by the Mary Foundation, but of course adapted to local needs. 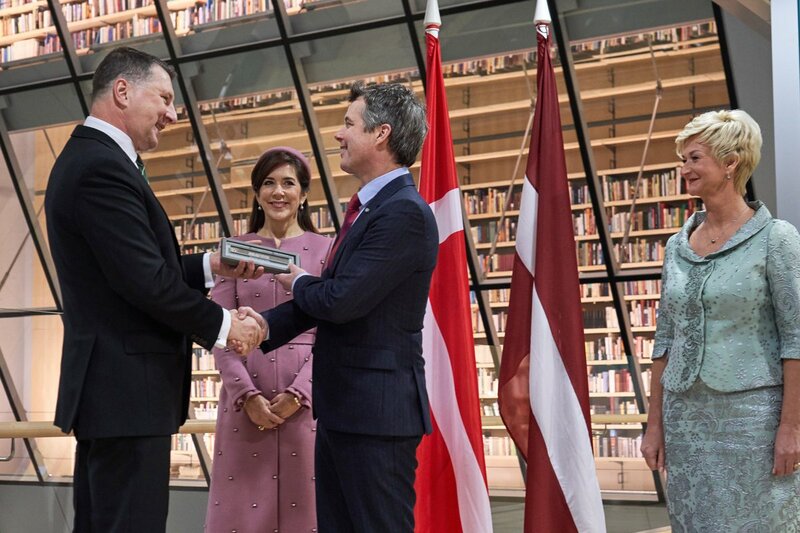 While Mary navigated her way through the snow drifts Frederik attended architect competition, that is Denmarks official present to Latvia. 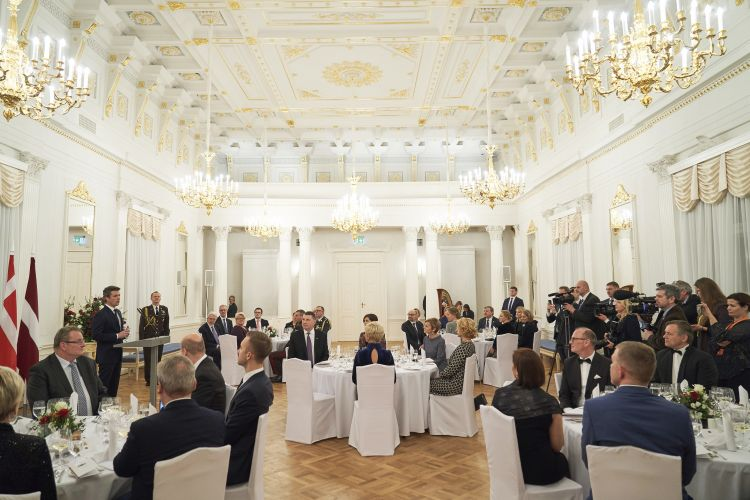 The visit culminated in an official dinner. Here Mary wore and outfit by Jesper Høvring. 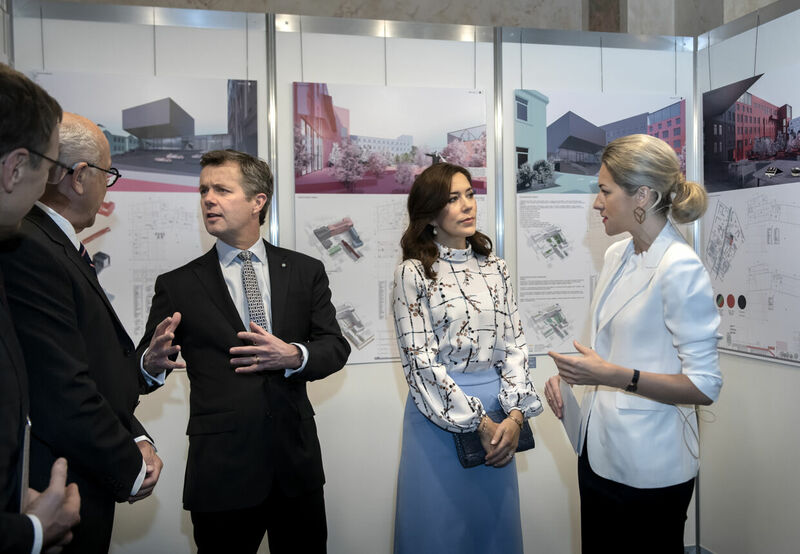 Frederik who first visited Lativia in 1992, right after they regained their independence, told our reporter how glad he was to have Mary with her on this visit. - Frederik worked as a staff officer at the Defence Command and wrote an analazys about the state of affairs in the Baltic countries and the security situation there, right after they regained their independence after the fall of the Wall in 1989. - There were as you may recall, several skirmishes between Baltic nationalists of Soviet troops. Thanks Muhler. It was a very nice trip. I remembered he wrote his master thesis on the Baltic countries, did not know he went in 1992.